A Girl's Guide to Drinking Alone is a blog created by Sammi Katz. I drink alone at bars, then review them for how awesome or awful they are for women to go to alone. Based in NYC. 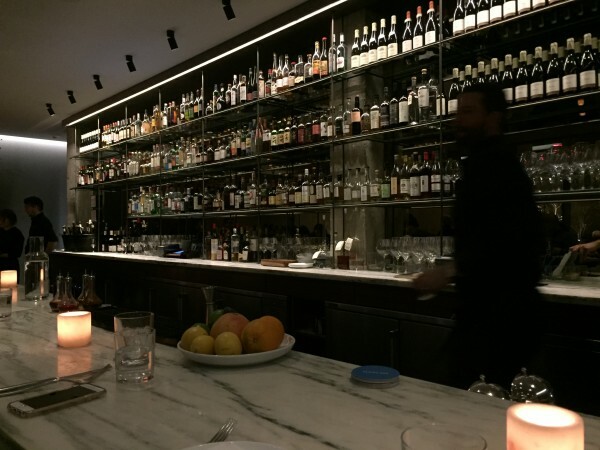 The Place: A trendy, upscale restaurant and bar underneath the Met Breuer museum that critics (and my mom) love. The Time: Thursday January 17, 7pm. After my hilarious failed attempt to drink alone at Nello, I figure I shouldn’t waste the fact that I put on a blazer. So I walk up Madison until I hit Flora Bar, which I know of because my mom has told me to drink here alone pretty much since I started this blog. The Vibe: It’s a big, buzzy spot underground, kind of like a dramatic, fashionable bunker. There seem to be two bars, but I make my way to the larger one further back. There’s a beautiful marble bar top, leather bar stools, and the back wall of the bar is filled with bottles and made of mirrors. The bar itself is pretty full, and about half the tables are occupied. Definitely a crowd that skews older, and it doesn’t seem like anyone else is here alone. Until a dapper gentleman wearing large spectacles and a pink tie sidles up to the end of the bar near me. He gets a glass of champagne poured for him (without having to ask for it!) then shakes hands with the bartender. He says hello to every server and busser that passes by. Then a manager comes up and enjoys some champagne with him. This is Regular Status like I’ve never seen before - so much so that I assume he must be a co-owner or something. He asks how the new happy hour program at the other bar is going, and is told that it’s going very well! I fully resent that no one told me about this said happy hour because this place, while less pricey than dumpster fire Nello, is still Upper East Side expensive. The Bartender: Two men, dressed all in black, who are very serious. They go to the kitchen often, retrieving food to deliver to guests at the bar, because most people come here to eat. 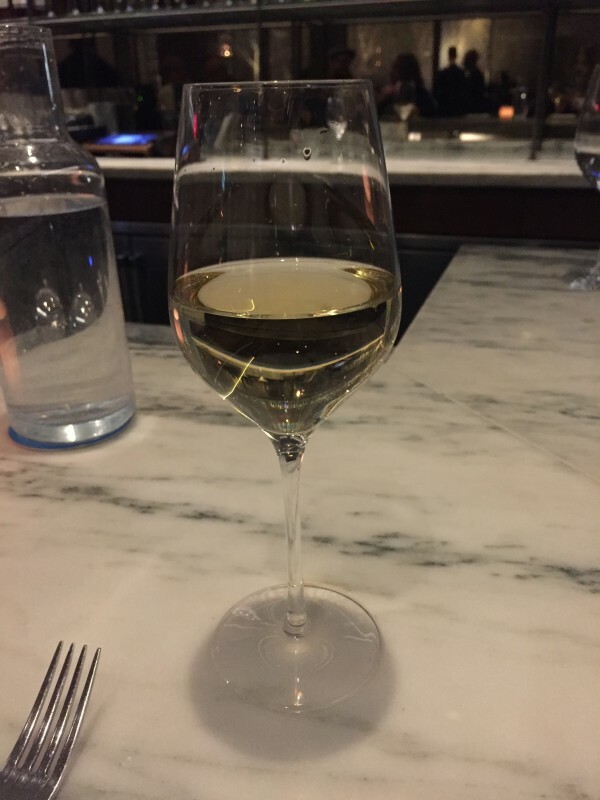 The Drank: I get an Italian white wine, a Fiano di Avellino, which I order because it is the second-cheapest white wine (and at $16, that is not cheap). Because I realize I too want to eat, I also order the burrata ($18) since the only other vegetarian option is potato croquettes, and somehow an entire plate of cheese feels healthier than fried potato balls. Was I Hit On? : If you’re thinking that Pink Tie must try to talk to me at some point, you’re right. As I get my check, he asks if my dinner is “just cheese and wine.” To which I respond, “absolutely.” He kind of shakes his head disapprovingly, so I ask if his dinner is “just champagne.” He says yes, because he had a late lunch. Then he adds “but sometimes, when I’m here, I also get the fries. They’re so good.” I am flabbergasted because I did NOT see fries on the menu! I tell him this, and he leans in and whispers “you have to ask for them specially.” I thank him for the pro tip, then depart peacefully into the cold night. Should You Drink Here Alone? : Sure I guess. I imagine that Flora Bar is a lovely place to grab a drink and a bite after looking at art for a few hours, and it’s perfectly pleasant even if you don’t. It’ll cost you a pretty penny though, and remember, you have to ask for the fries. A Girl's Guide to Drinking Alone is a blog where I drink alone at bars, then review them for how awesome or awful they are for women to go to alone.